Best Fish Finder Reviews 2019 - Find the right one, fast. Buying fish finders can be tough – overwhelming even, with so many choices available! To make things easier for you, we’ve split up all the fish finders we carry into different categories and chosen the best fish finders – the toppers – from each. You can also refer to our guide on How To Choose A Fish Finder if you want to get into the nitty gritties, and if you are a kayak person, we’ve also got a section on The Best Fish Finder For Small Boats & Kayaks. If you want ultra-portability, check out our section on fish finder apps. Just because you don’t own a boat doesn’t mean you can’t use a sounder to find more fish! These fish finder models are designed with ultra-portability in mind, so as long as you have a fishing rod and reel, you’ll be fine. Whether you choose to fish from shore or on the water, in the cold or in the heat, rain or shine, this finder can get into those tight spots where the big fish hide. The compact baseball size makes it easily transportable and easy to cast for both on-the-water fishing in a boat, kayak, or tube and for on-shore fishing from bridges, docks, embankments, and other hidden secret spots. Easily synchronize this rechargeable finder to your portable devices such as a tablet, phone (both Android and Apple iOS), or pad via Bluetooth for up to four hours of operating time. This app also includes handy statistics such as weather, maps, diary, a fish activity calendar and the ability to share your information with fellow fishermen in full color. Once activated, this finder will deliver a dual beam; a narrow cone of 15 Degrees (290 kHz) and wide cone of 55 Degrees (90 kHz), to a depth of 130 ft. The VirtuView HD color display is a portable or mountable hand-held unit that is 6 inches long, 3 inches wide, and 2 inches high. This totally portable unit is perfect for the angler who would rather concentrate on the fishing rather than fussing with buttons and knobs to find their prey. Audible sounds allow you to monitor the water depth and fish presence, while you continue fishing in peace without having to look and check the locater every few minutes. The dual frequency FishTrax Intelligent Sonar with 100-Level sensitivity adjustability allows you to hone in on the prey without interruption from bothersome information such as your lure or bait in the water. With the fish depth identifier, you are able to see what is lurking below and how far down the fish are feeding, bedding, or traveling. This sturdy model will not only help you fill your fish well in the summer, but it is also equipped with an ice-mode digital flasher for ice-fishing excursions. This locater operates on the power of four AAA batteries and comes with additional support and manufacturer warranty; this technical support is available upon request to the customer service department. For complete instructions, this model comes with a manual that is in English, with 15 additional languages from which to choose. This unit is perfect for the fishing enthusiast who is interested in sitting back and “listening” for the fish to show up to the party. These depth finders(fish finders, sounders, depth finders, all the same) are very basic models that have color screens. The advantage of a color screen is that you can tell the SONAR returns apart with greater clarity. 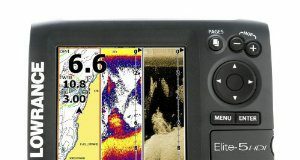 Garmin Striker 4 – Garmin is truly one of the best brands when it comes to navigation and fish finding. The Garmin Striker 4 costs less than $150, but still packs GPS and crisp 77/200 kHz CHIRP SONAR into a small and convenient package. The Striker 4 is the way to go if you are constrained by both budget and space. With features such as smooth scaling(adjusting the screen depending on depth), auto-detecting fish, and the ability to mark waypoints, the Striker 4 goes up against much more advanced fish finders and does a hell of a job at it. If you really want to get a look at the world beneath your craft, this high resolution 4.3-inch (109.22 mm), 480 x 272 resolution, color display is backlit with LED lighting and is great for use with a kayak or small craft. The CHIRP Sonar plus DownScan Imaging™ puts two of the leading technologies together working off of a simple 12v DC battery to increase your odds against your underwater adversaries. The Auto Adjust with ASP (Advanced Signal Processing) allows for clear view without the need for constant manual adjustments. Once you find where the fish are hanging out, this unit stores and tracks the history of your recorded sonar with TrackBack™ technology. You can view and track essential information such as bottom conditions, underwater structures, and favorite fishing locations. The Multi-Window Display gives the angler the option of choosing pre-set pages from a three-panel view of page layouts that can be easily accessed with the swipe of one finger. Raymarine Dragonfly 5 – The Raymarine Dragonfly is a whole new ballgame when it comes to fish finding. With a powerful GPS, as well as a state-of-the-art CHIRP SONAR, Raymarine has packed features found in models that cost thousands of dollars into a unit that you can grab for less than $700. Plus there is a generous 5 inch display. What really makes the Dragonfly stand out though is that you can operate the whole thing with just 3 buttons. It’s that easy to use! Lowrance Hook 5x – Released early this year, the Hook 5x is part of Lowrance’s new Hook family, which is a budget Lowrance series to combine traditional SONAR and DownScan Imaging. In the Hook-5x, you get 4 frequencies of fish finding all packaged neatly into one little transducer. The Hook-5x is a great option for you if you want power and functionality but don’t want to break the bank. The only catch is that it doesn’t have GPS built in. If you want GPS, consider the Hook-5x’s big brother, the Hook-5. 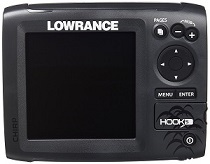 Lowrance Hook 5 Fish Finder/GPS – The Lowrance Hook 5 is a mid-sized, high-power fish finder. It has both traditional SONAR and DownScan that you can also view side-by-side, and uses CHIRP technology so you get a very sharp image all the time. It also has a GPS antenna that provides accurate signals. The built-in mapping package is already quite advanced (featuring 3000 US lakes and rivers and also coastal areas), and you can expand the mapping package using the built in MicroSD card slot for really detailed charts like Navionics Gold and C-Map(see this page for more information). There is no need to invest in extra technologies with this locating unit; it is delivered with a power/data cable, trolling motor mount (with hardware), and full documentation. The large 4.3-inch display with high-contrast color and automatic screen brightness adjustments are quick to deliver your pre-set heading and position; this information is updated every five seconds for the most accurate readings of your saved sweet spots and fast recording of new areas you may encounter. The Garmin Echomap 44dv finder delivers your desired information quickly and accurately with the power of a built-in 500 W traditional High-Density ID sonar with DownVu scanning. The wiring for this unit plugs in and out of the quick release mount for ease in storage or transporting from trolling to transom to storage locations. This unit features mapping capabilities through the use of the echo MAP 44dv with U.S. Blue Chart g2 in harmony with the GT20-TM transducer and a 12 V battery. This fish finder is the catch of the day for the fisher-person looking for a finder that is fast, powerful, and easily re-located when you are in the “heat of battle” against the biggest gilled gladiators in your honey holes. Join in with other GoFree partners using this locater’s wireless connection through GoFree Cloud and view their maps on this unit’s widescreen LCD display. Share your experiences or shop for and access Insight maps that can be purchased and downloaded immediately to this 500W fish finding unit. Once you have located your catch, utilize the TrackBack™ technology to record and save the location so that it may be accessed using the 800 x 480 resolution touch screen to select desired DownScan or SideScan waypoint settings. The GPS antenna is built-in to deliver the highest level of accuracy when storing information on the microSD card. In order to keep your vital fishing information up to date, this unit offers optional chart upgrades from Jeppesen (C-MAP MAX-N/N+), Fugawi Aboard, Navionics Gold, NV Charts, Platinum+ and Navionics+, and more. If you are the active angler who likes to keep track of many different locations, this unit is well worth the investment for your future fishing success. With side imaging technology you can see to both sides of your boat – very useful for mapping out an entire lake beforehand and covering a lot of distance in one shot. Side Imaging is a technology which builds up on Down Imaging. Side Imaging lets you see up to 240 feet on either side of your boat, giving you an overview of all of the structure underneath your boat. It’s not very useful for seeing what’s floating in the water column itself, but you can cover an amazing amount of water in very little time using it and see all the structure. It’s very useful for mapping out entire lakes. Side Imaging is pretty expensive on most models, though, and would probably set you back a hefty wad of cash. Luckily, Humminbird has looked into that and the Helix-5 SI brings you that same technology for less than $500. The summer sun is great for tans, picnics, and fishing, but often not so great when it comes to trying to view a video screen in the bright daylight; unless you have this unit attached to your craft. Boasting a 16.9-inch widescreen Glass-Bonded Display, this unit offers anglers a 480 x 800 pixel resolution that is glare-free and viewable from any angle with the power (500W) of one 12V battery. Anglers can track water temperature, boat speed, favored locations, switch settings (metric and temperature) units, and access waypoints quickly and effortlessly with this unit thanks to the double RAM capabilities of this finder. This unit has the virtual space to store up to 45 different routes, 2,500 waypoints, and to support many mapping programs such as AutoChart, LakeMaster, AutoChart Pro, and Navionics Gold/HotMaps. Being able to view under your craft to a depth of 600 feet or to the side for 100 feet definitely gives you the advantage over your aquatic targets. Humminbird Helix 10 SI – The Helix 10 SI is the Helix 5 SI’s bigger brother. It’s got a huge, 10 inch widescreen display which is really good for seeing Side Imaging readings, and it’s also got networking, traditional SONAR, and robust GPS. It’s like a hybrid cross between the Lowrance HDS and the smaller Helix series fish finders. This fish finder is for serious anglers who want nothing but the best for their boats. Lowrance HDS Series – If you have the budget, the Lowrance HDS is a no-brainer. With powerful maps, very good SONAR, and the ability to add on DownScan and Side Imaging together with the LSS-2 StructureScan module, your fishing boat will become an unstoppable fish catching machine. You can also hook up any NMEA 2000 compatible electronics to see them on the HDS display. But my favorite feature, by far, is the fact that you can overlay Side Imaging data on a map and see both SONAR and mapping at once. The HDS series comes in sizes ranging from 5 inches to 12 inches, varying in price, too, so there is something for every budget. Built to withstand the winter cold, this locater is the perfect tool for the avid ice-fisherman to have handy in the ice shack. With a 200-foot depth reading capability, three color flasher fiber optics, and dual frequency sonar option, this unit is an exceptional tool for winter-time fishing. This unit utilizes the technology of the new ICE Series of finders that offers users 526 segment fiber optics, adjustable zoom, and LCD extreme-temperature auto bottom location. Although larger than many other models at 13.5 inches long, 12.3 inches wide, and 8.1 inches high, this unit has the capacity to hold a battery charge for up to 12 hours of blissful ice-fishing from the single charge of the rechargeable battery. Along with a fish finder, you’ll also need a decent trolling motor. We’ve got you covered there, too.Check out our guides on the best trolling motor, and also our detailed trolling motor reviews.